The State House is located at 1100 Gervais Street, which is at the intersection of Gervais and Main Streets, Columbia, South Carolina. Guided tours are available free-of-charge. Each tour is preceded with the viewing of a 15 minute DVD on the history and architecture of the State House. Reservations for groups are recommended. Once a reservation is made, the tour office will send an information packet which includes information on parking. Typically, parking is allowed along Sumter Street for school buses and vans. Private vehicles must use metered spaces near the State House. For more information or to schedule a guided tour, call the Tour Desk at (803) 734-2430. • While the legislature is in session (January - May), tours are offered every half hour beginning at 9:30 a.m. and ending at 3:30 p.m. Tours are not offered at 12 p.m. or 12:30 p.m. during these months. • Following session (June - December), tours are available every hour on the half hour beginning at 9:30 a.m. and ending at 3:30 p.m.. Tours are not offered at 12:30 p.m. during these months. • The State House is also open for tours each Saturday (beginning July 12, 2014) except on the Saturdays after Thanksgiving and Christmas. Tours are given at 10:30 a.m., 11:30 a.m., 1:30 p.m. and 2:30 p.m. Visitors can also tour at their own pace using brochures available in the State House. The State House will be open between the hours of 10:00 a.m. and 4:00 p.m.
• Walk-in tours are welcomed and encouraged. • Please call ahead if you plan on bringing a group larger than 10. If you have more than the maximum of 50 tour attendees, multiple times must be reserved for the groups. From Greenville SC: Follow I-385 S approximately 42.0 miles as it becomes I-26 E. Continue on I-26 E for approximately 55.9 miles. Take I-126 E / LESTER BATES FWY / US-76 E toward Columbia for 3.3 miles. Merge onto HUGER ST / US-176 E / US-21 S / US-321 S and continue for 1.0 mile. 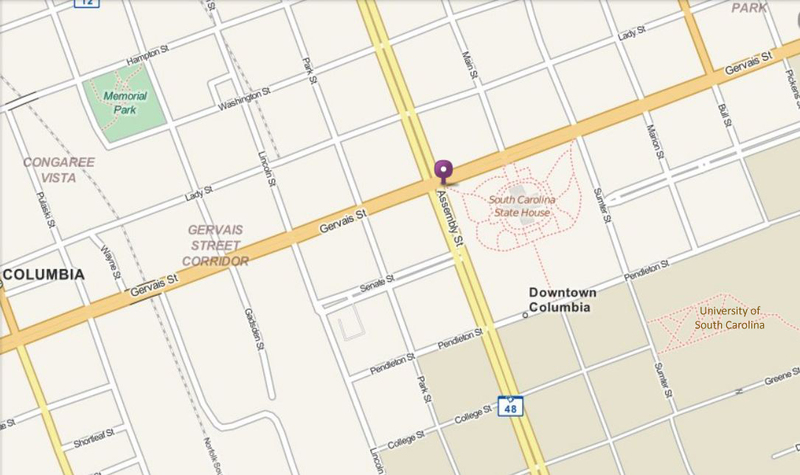 Turn LEFT onto GERVAIS ST / US-378 E / US-1 N and continue for 0.5 miles to ASSEMBLY and GERVAIS STREETS. Continue on Gervais Street to Main Street. The State House is located at the intersection of Gervais and Main Streets. From Charleston, SC: Follow I-26 W approximately 104.6 miles. Merge onto US-176 W / US-21 N / US-321 N via EXIT 115 toward CAYCE / COLUMBIA and continue for 6.0 miles. Turn LEFT onto US-176 / US-21 / US-321 / HUGER ST and continue for 0.5 miles. Turn RIGHT onto GERVAIS ST / US-378 E / US-1 N and continue for 0.5 miles to ASSEMBLY and GERVAIS STREETS. Continue on Gervais Street to Main Street. The State House is located at the intersection of Gervais and Main Streets. From Myrtle Beach, SC: Follow N KINGS HWY / US-17 BR to MAIN ST / US-501. Continue to follow US-501 N for 43.6 miles. Stay STRAIGHT to go onto US-501 BR N and follow for 0.4 miles. US-501 BR N becomes SC-576 W. Continue for 3.2 miles as SC-576 W becomes US-76 W. Continue for 22.5 miles. Turn RIGHT onto I-20 SPUR W / DAVID H MCLEOD BLVD. Continue to follow I-20 SPUR W for 2.1 miles. Take I-20 W and continue for 68.1 miles. Merge onto SC-277 S via EXIT 73A toward Columbia for 6.6 miles and turn RIGHT onto ELMWOOD AVE / US-76. Continue for 0.3 miles and turn LEFT onto ASSEMBLY ST / SC-48 S. Follow for 0.8 miles and turn LEFT onto US-378 E / US-1 N / GERVAIS ST. Continue on Gervais Street to Main Street. The State House is located at the intersection of Gervais and Main Streets. From Aiken, SC: Follow SC-19 N to I-20 E. Merge onto I-20 E and continue for 46.0 miles. Merge onto US-76 E via EXIT 64A toward Columbia and continue 4.1 miles. Merge onto HUGER ST / US-176 E / US-21 S / US-321 S and continue for 1.0 mile. Turn LEFT onto GERVAIS ST / US-378 E / US-1 N and continue for 0.5 miles to ASSEMBLY and GERVAIS STREETS. Continue on Gervais Street to Main Street. The State House is located at the intersection of Gervais and Main Streets.